where they placed 10th in the country. they placed 10th in the country. This annual event is the Club's main fundraiser and supports many of the Club projects during the year as well as scholarships awarded to High School Seniors based on achievement, community service and need. 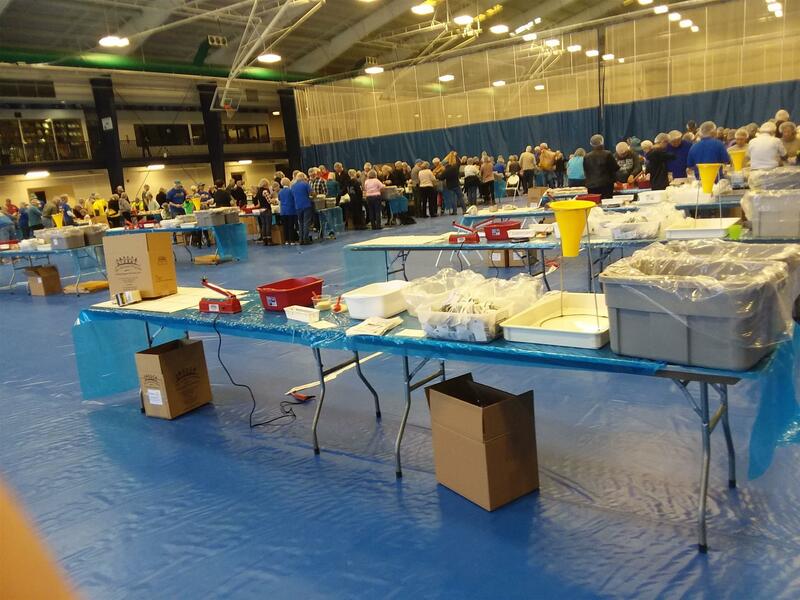 A few hundreds of Rotarians, Friends and young people gathered to pack many thousands of food packet for distribution to local NJ support groups. Each year Camp Merry heart has a carnival honoring District 7470 Clubs that have contributed to their efforts over the years. 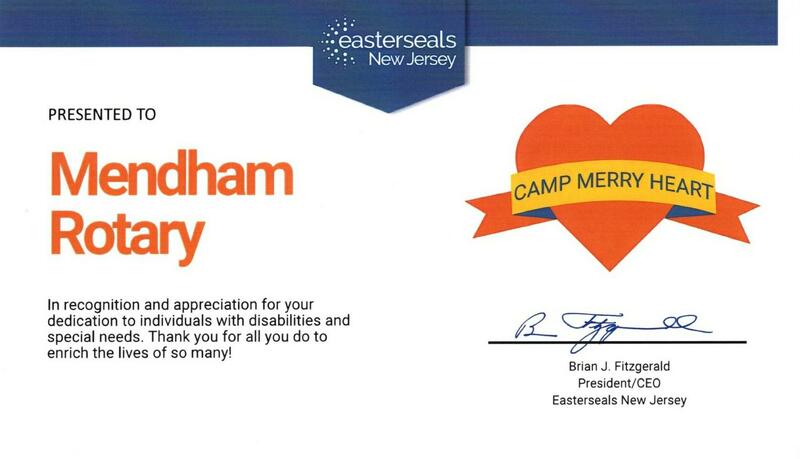 Mendham Rotary Club received a certificate thanking them for participating. 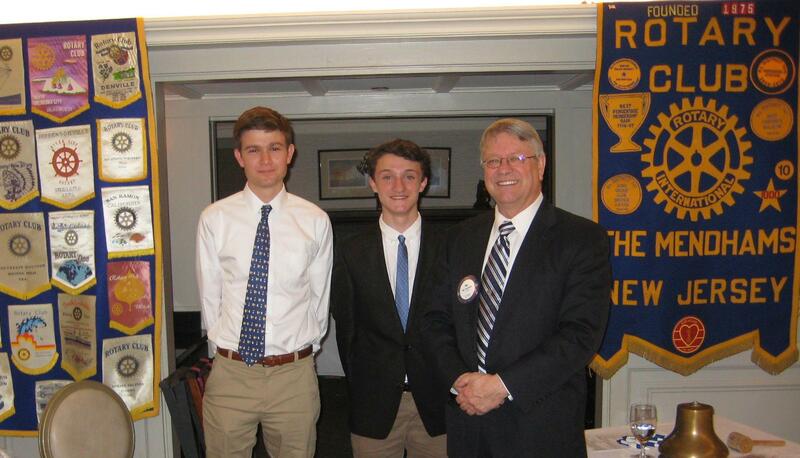 Mendham Rota rian Bill Connelly brought guests Matthew Riss (left) and Eric Szakiel (right) to a Club meeting. Both Matthew and Eric are on the High School Mock Trial team. The student lawyers impressed the club members with opening and closing arguments for a trial involving a complex current topic. Bill is a local lawyer who runs the Mock Trial team at the Mendham High School which has had great success. The links for weekly/monthly RI updates have been eliminated. Just before Thanksgiving, Mendham Rotary Club completed their Gift of Knowledge project in Mendham. The Club distributed dictionaries to all third grade students at Mendham Borough and Mendham Township grammar schools as well as St. Josephs school. 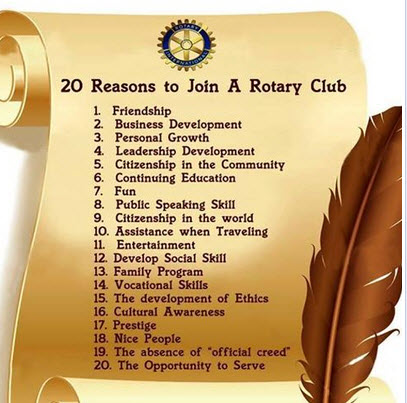 The club has done this every year for the last 10+ years in hopes of promoting education and understanding of the world beyond the local community. 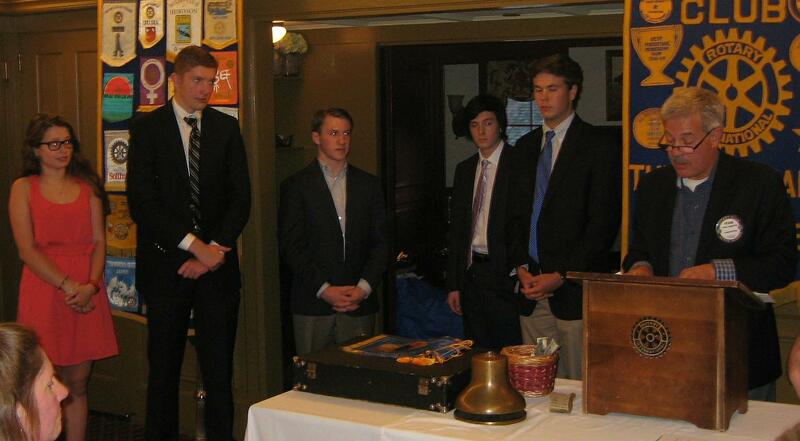 BlinkNow Board of Directors and Director Ruth Dekker made a surprise visit to our Club at last week's meeting. We had the pleasure of meeting four of Maggie Doyne's children from Nepal who are here visting. One is returning to Kopila Valley Home and School and the other three will remain here and attend school for the fall term. Two will attend Mendham Township Middle School and the third will attend Peck in Morristown. Their names are from the left Bhakta, Krishna, Sagar, Padam . Together they told us about their lives and experiences both since they arrived here and their lives growing up in Surkhet. They were very happy that chicken was on the menu at the Rotary meeting. Thank you to Frank and June for orchestrating this program. 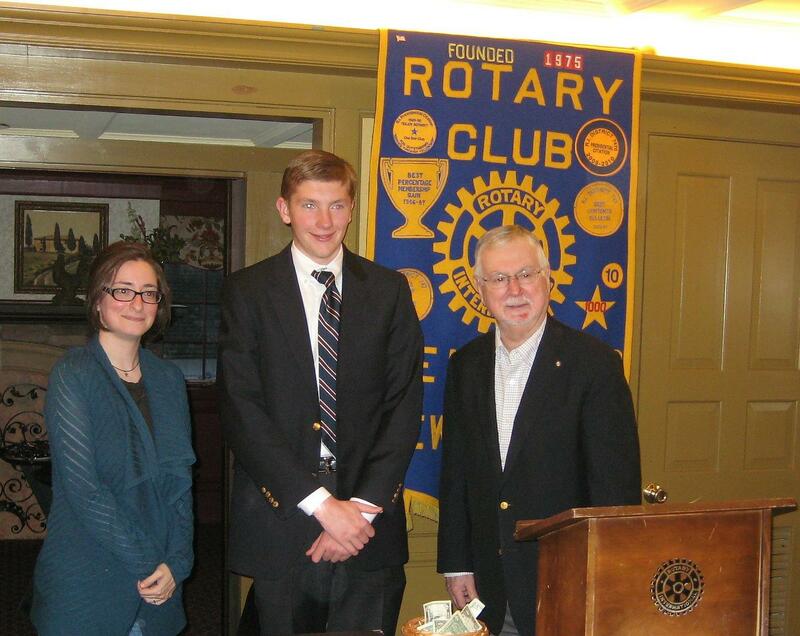 Mendham Rotary awards this year's scholarships to Mendham High School senior. 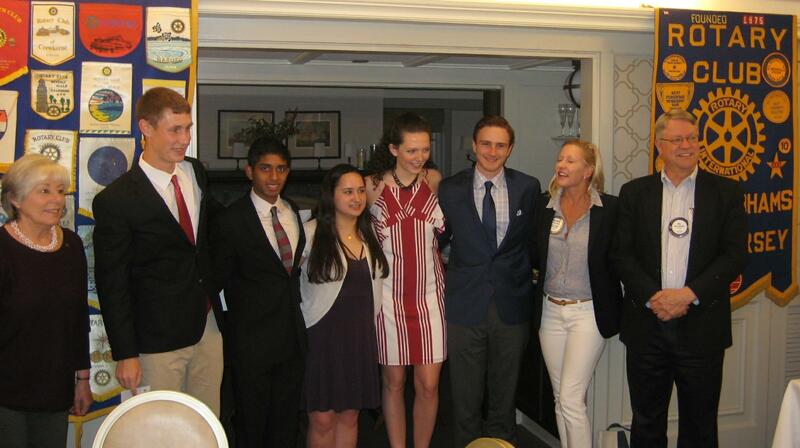 This year Mendham Rotary was able to award scholarships to five Mendham High School seniors. 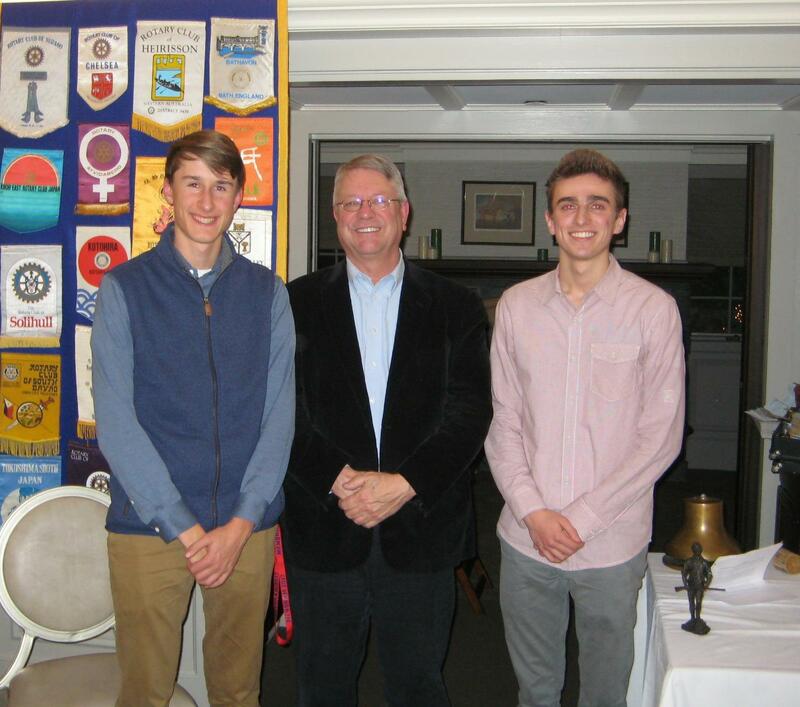 Three were Rotary Club Scholarships. In addition, this year, we awarded The Georgine Meyer Memorial Scholarship funded by a bequest from Georgine Meyer's will. 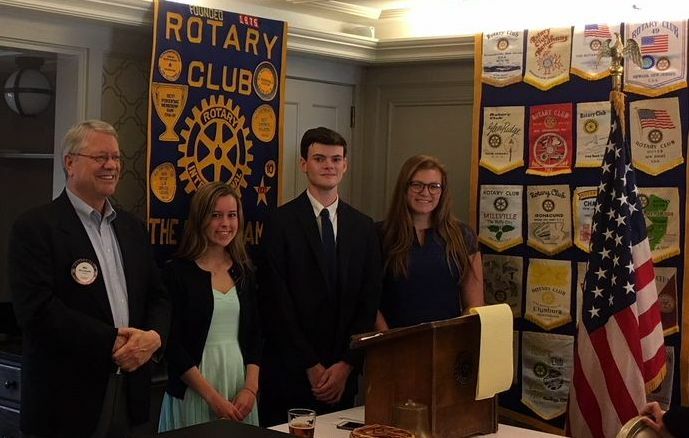 A second scholarship, The Adrienne Pinto Community Service Scholarship was awarded which was funded by donation in memory of Adrienne Pinto who was President of the Mendham Rotary Club when she passed away recently. Scholarship recipients in picture from left: Ella Cusano, John Kemp, Matthew Hanks, Andrew DiCarlo and Nicholas Agoglia are being presented with their scholarships by Frank Cioppettini of the Scholarship Committee. 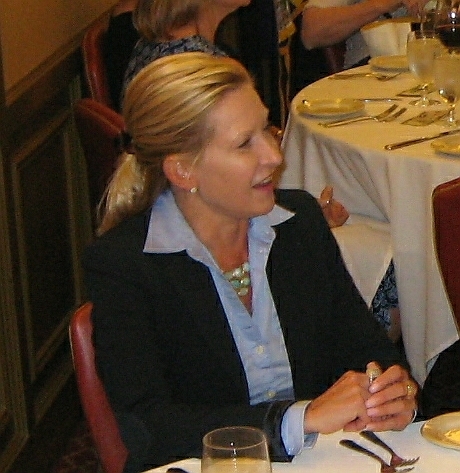 Melinda Meyer attended meeting for the presentation of the Georgine Meyer Memorial Scholarship. Mendham Rotary recently completed a District Grant in favor of the Mendham Area Senior Housing (MASH) in Mendham. The grant supplied MASH with an All-In-One computer along with an All-In-One printer which can copy, scan, print, etc.. The new system was setup for MASH by the Village Computer Center in Bernardsville. The system is already experiences high usage by the MASH residents confirming that it was greatly needed. 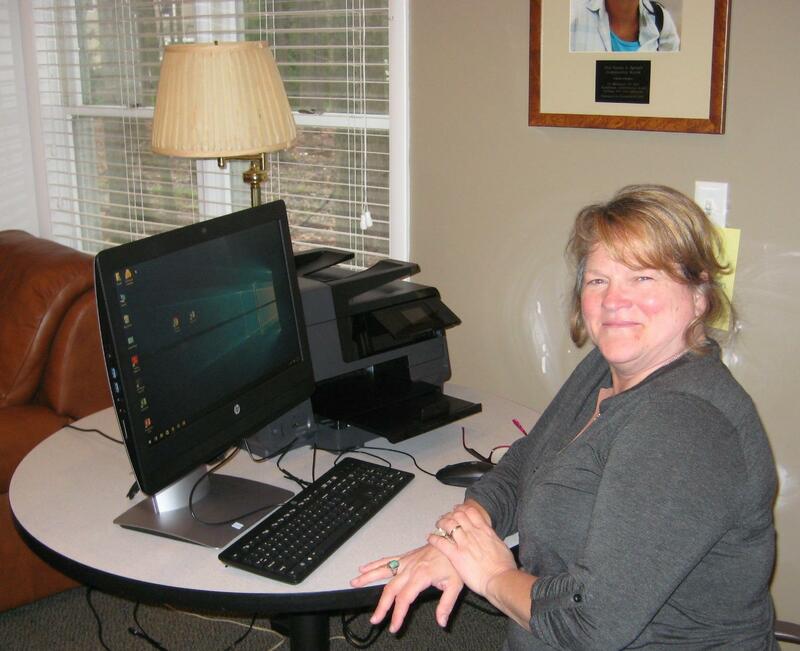 MASH Executive Director, Catherine Maresca takes a turn at the new computer system installed in their common room at the facility. Mendham Rotary Club joined with the Dhule Crossroad Rotary Club in Dhule India in a Global Grant to renovate two schools: the Kundane School and the S.V School in the Dhule area. In February 2016 Dilip Vora (right) of Mendham Rotary Club and Madhur Kucharia (left) of the Dhule Crossroad Rotary Club visited the schools to view the progress which had been made. 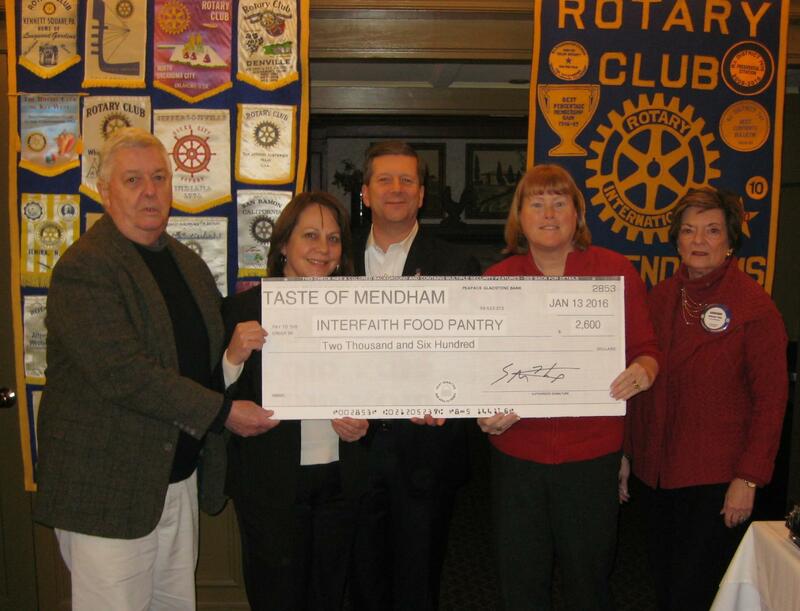 Rotary presented a check for $2,600 to the Interfaith Food Pantry which represented the profits realized from the Taste Of Mendham project. 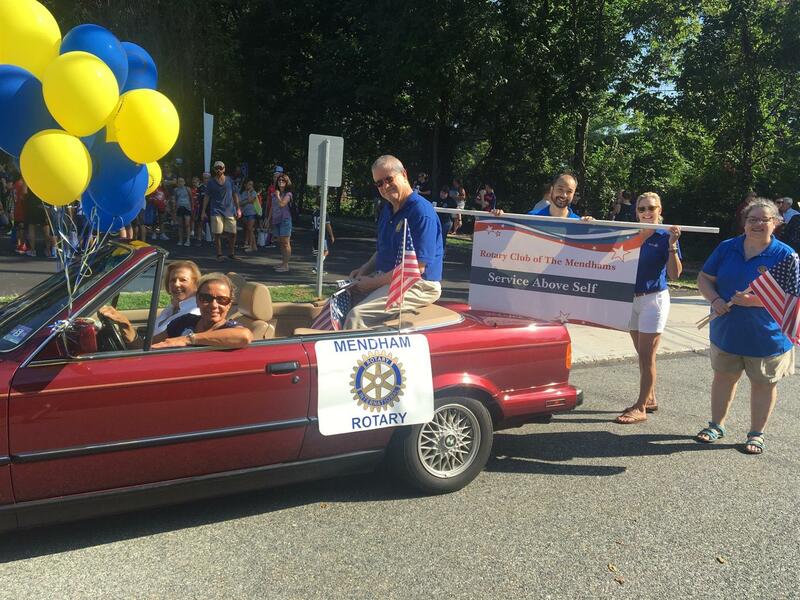 From left are: Russ Hall and Caroline Lake of the Interfaith Food Pantry, Stan Gorski, organizer of Taste Of Mendham, June Cioppettini, Mendham Rotary project coordinator and party planner and Adrienne Pinto, Mendham Rotary President. 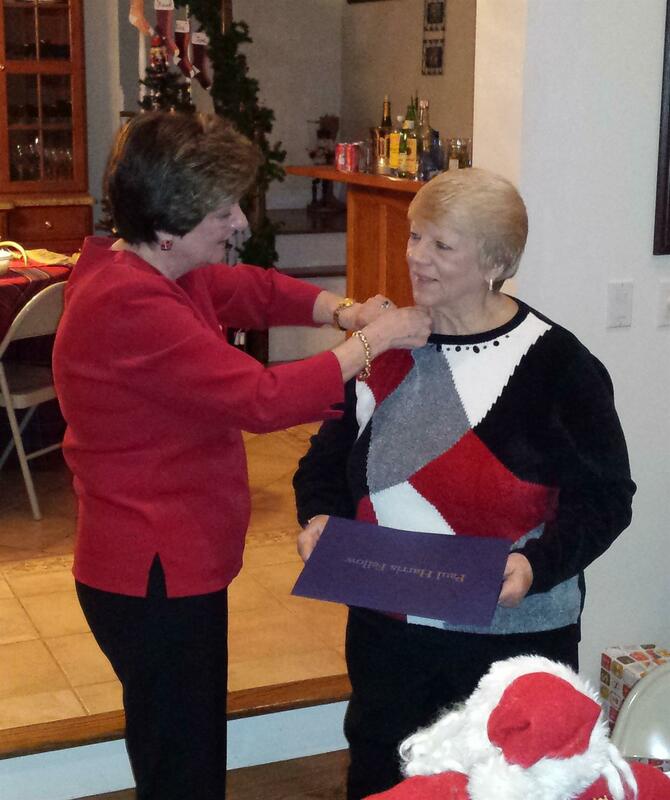 At the Club's annual Christmas party last Saturday, President Adrienne had the pleasure on behalf of the club of awarding a Paul Harris Fellowship to long time Mendham Borough employee Helen Cleary. Helen retired recently after 27 years of service in the Borough offices in Mendham. She worked in many departments over the years but most recently ruled over the Department of Health and the Tax Assessor's office. The first face you always saw when entering the Bowers Building was Helen's welcoming presents. Always polite and helpful with whatever you were looking for. She made gave Mendham a reputation of standing out among municipalities in servicing the town and its residents. 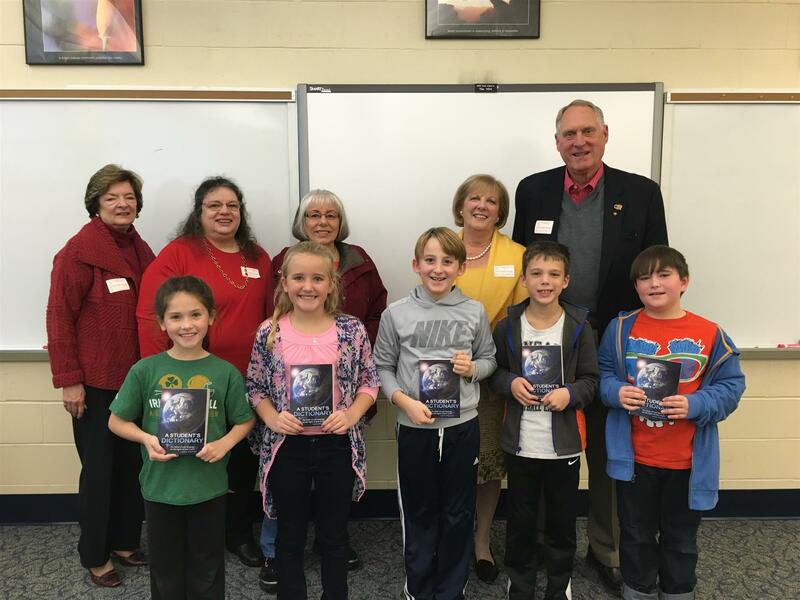 Mendham Rotary delivered dictionaries to the 3rd graders Mendham Township Lower School in Brookside on November 10th. Thanks to all who participated. Mendham Rotary and the Dictionary Project got a good write-up in the Mendham Township Elementary School (MTES) Tiger Tales which was nice. https://mtestigertales.wordpress.com/ Take as look. 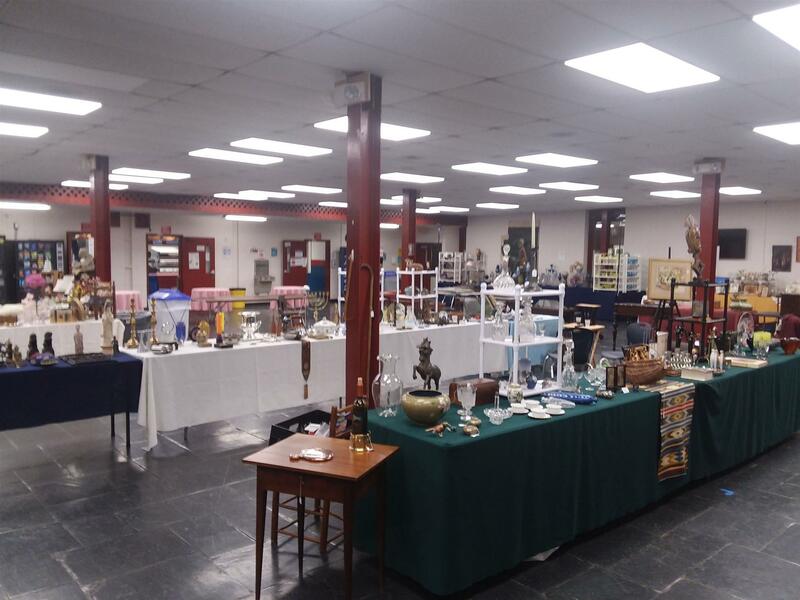 Taste of Men dham took place at the Brookside Community Center Sunday Night sponsored by Mendham Rotary in favor of the Interfaith Food Pantry (IFP). Inspite of the cold, there was a good turnout and everyone seemed to enjoy the event. 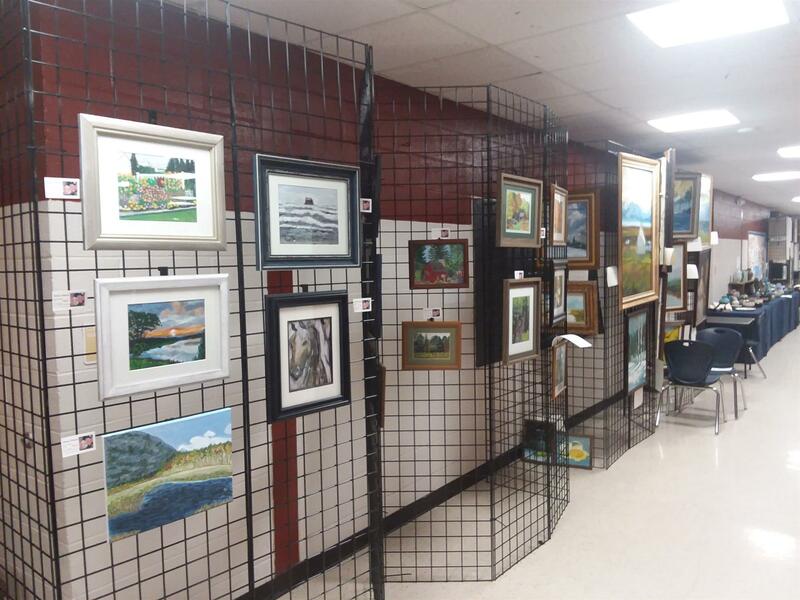 Thanks to the Rotarians who helped setup and man the show. Special thanks to June and Frank who organized it.